2 Lads Sparkling Pinot Grigio is an ideal holiday wine that pairs well with a range of flavors, complementing everything from your favorite appetizers to entrees, even dessert! Plus, this wine brings an added elegance to any holiday table. This time of the year is the right time for Pinot Noir, and Black Star Farms suggests their 2011 Arcturos Pinot Noir. The lighter body of the Pinot Noir is the perfect match for lighter meats and holiday fare. Bowers Harbor Vineyard 100% Pinot Noir Rosé is another fantastic option this holiday season. Bursting with fresh watermelon, strawberry, and cranberry, this Rosé complements turkey and holiday traditions. Though it is considered a dry wine, it drinks with a variety of palettes, so enjoy this fruity and light spice. This holiday season, reach for a Pinot Noir or a Dry Riesling – both complement earthly fall flavors and holiday spice. Brys Estate Vineyard & Winery Pinot Noir pairs beautifully with roasted vegetables, while their Dry Riesling will complement stuffing with apples and spice. Also, try the Dry Riesling with a rich butternut squash bisque or curried carrot soup. It’s sure to please. 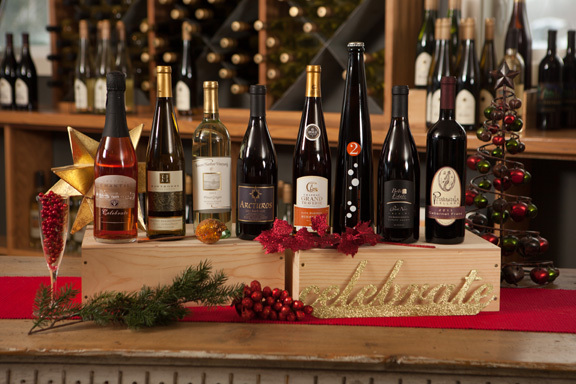 Chateau Chantal offers their Naughty & Nice Red and White wines during the holidays. Perfect as a fun wine gift for the season. Ranging from dry to sweet, there is a selection for everyone at the table among these four wines. The Naughty Red and White are dry, while the Nice Red and White are the sweet versions of the same wine blend. The 40th Anniversary wine, the 2013 Etcetera Rosé, from Chateau Grand Traverse is the perfect pairing for a holiday feast. Its robust, off-dry flavors offer pepper-like qualities that are sure to hold up to any poultry or white meat dish. The creamy finish and off-dry style make it versatile to share with grilled vegetables or pasta dishes. This rosé wine is celebratory in nature, as it was created to embrace the 40 years Chateau Grand Traverse has spent crafting wines on Old Mission Peninsula. The perfect pairing for a holiday prime rib with a creamy horseradish sauce or an herbed rack of lamb with rosemary and thyme is Peninsula Cellars award winning Cabernet Franc. This dry red wine, voted best-of-class dry red and double gold for two consecutive years, boasts rich mocha and deep berry flavors. This holiday season, taste, learn, share, and enjoy wines from Old Mission Peninsula! The Wineries of Old Mission Peninsula’s annual Day of Giving is the perfect time to stock up on these award-winning wines. On Saturday, December 13, the wineries will donate 15% of tasting room and online sales to Northern Michigan nonprofit organizations. Make a weekend out of it by pairing with the December 11 Ladies’ Night shopping and noshing extravaganza in Downtown Traverse City! Jutting north between the azure arms of Lake Michigan's Grand Traverse Bay lies Old Mission Peninsula. Situated at the globe's 45th parallel – an ideal climate for growing varietal wine grapes – the eight distinct wineries that comprise the Wineries of Old Mission Peninsula® and this stunning appellation have been well recognized by wine enthusiasts around the world.